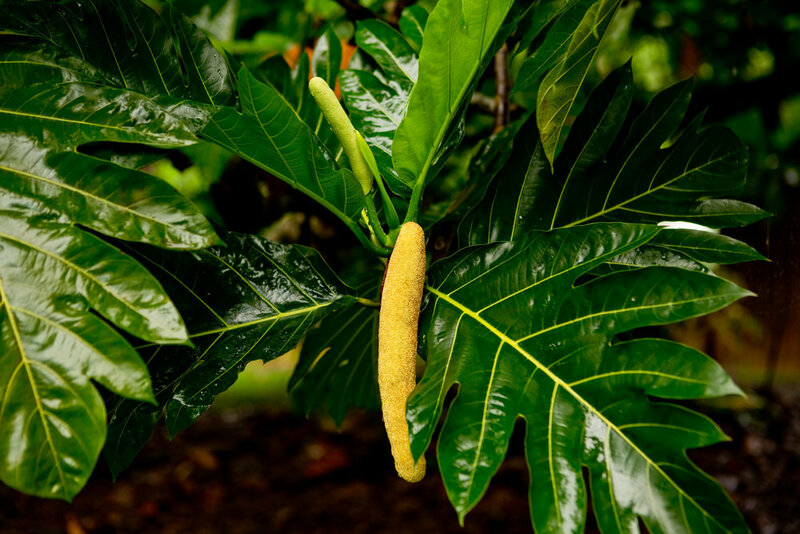 All Altilis Beauty® products are made with unique and powerful skin rejuvenating phytochemicals extracted from breadfruit (Artocarpus altilis) flowers. We source breadfruit flowers directly from microfarmers in Samoa, where breadfruit grows in abundance. Altilis Beauty® founder Kenna Whitnell is a biochemist who discovered the skin care benefits of breadfruit while engaged in research at the University of British Columbia. See Kenna’s story. Breadfruit flowers are a rich sources of unique phytochemicals, including the flavonoid Artocarpin, which has proven UV-protective and anti-cancer properties. The breadfruit compound in our InflorEssence skincare line is an effective antioxidant that scavenges free radicals that damage and age skin. The unique collection of fatty acids present in breadfruit is soothing to the skin. Breadfruit contains a fatty acid called Azelaic acid, which has anti-inflammatory properties and is used in cosmetics to reduce acne and rosacea. Early testing with breadfruit as a skin care ingredient occurred in the summertime, which resulted in the discovery that breadfruit is great for mosquito bites! Breadfruit’s unique fatty acid profile replenishes the skin’s natural lipid barrier, resulting in a glowing complexion. Terpenes (components of essential oils) and flavonoids offer antioxidant and UVB protective properties which protect the skin from sun and environmental damage. The main compound of our breadfruit flower extract, 2-geranyl-2',3,4,4'-tetrahydroxydihydrochalcone, is a potent inhibitor of cathepsin K (Patil et al 2002). This enzyme is responsible for collagen and elastin breakdown and inhibiting it slows these processes. Gotu Kola - Astringent, antimicrobial and skin healing properties. Stimulates collagen growth and scavenges free radicals. Honeybush - Improves skin texture and smoothness. Provides antioxidant and photoprotective properties. Acemannan Polysaccharides (from Aloe vera) - Reduces fine lines, wrinkles and age spots. Promotes healthy cell turnover. Anti-rosaceae. All InflorEssence ingredients and final products are scientifically tested for safety and purity. See all ingredients. Patil AD, Freyer AJ, Killmer L, Offen P, Taylor PB, Votta BJ, Johnson RK. 2002. A new dimeric dihydrochalcone and a new prenylated flavone from the bud covers of Artocarpus altilis: potent inhibitors of cathepsin K. J Nat Prod. 65; 624-627.